A report of a standalone Samsung smartwatch and another suggesting that Samsung would also release a smartwatch with a curved display have both proven to be true. Samsung surprised us a little tonight with its announcement of the Samsung Gear S! While its Unpacked event is just around the corner, Samsung probably didn’t want to divert too much attention from the highly-anticipated Galaxy Note 4, and also likely wanted to pre-empt LG’s announcement of the G Watch R.
What makes the Samsung Gear S stand out from the G Watch R and the other smartwatches we’re likely to see at IFA 2014, other than the fact that it runs on Tizen, is that the Gear S isn’t a companion device, but can function independently of the smartphone to make and receive calls. That’s possible thanks to the SIM-slot on the back. Of course, pairing with your smartphone, via Bluetooth, is still possible, and users can easily switch between syncing with their phones or using the smartwatch as a standalone device. One of the key features of the Gear S is its 2-inch curved AMOLED display, with a high resolution of 360 x 480. With everything else it packs, the Gear S is certainly an exciting device for its hardware, arguably more than for its software. You can check out the full list of specifications and features in the table below. 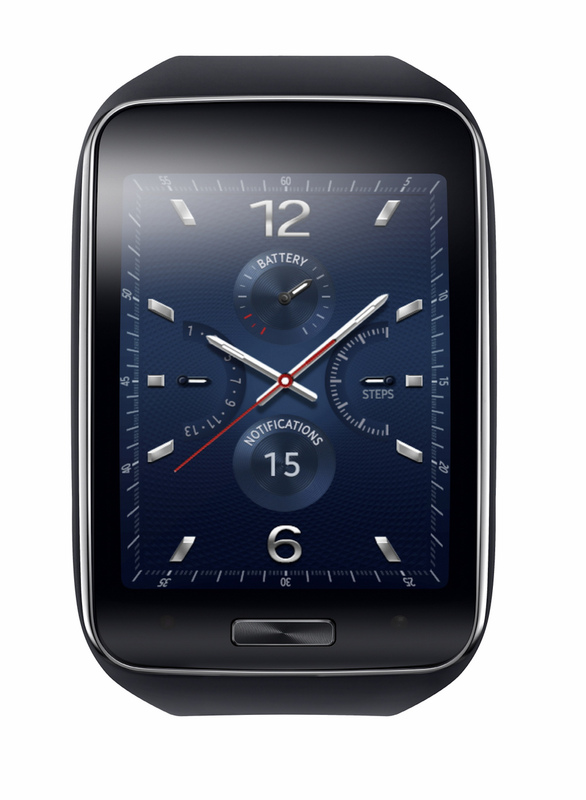 Samsung will make the Gear S available in October. It’s likely to be prioritized for Asian and European markets as they generally tend to play much nicer with unlocked, open hardware and they are easier markets for Samsung to enter initially. Being a 3G device, the Gear S will work on T-Mobile and AT&T, but details on the US launch are still unknown. The competition in the smartwatch space is certainly heating up, and it’ll be very interesting to see how consumers react to the Samsung Gear S.
What do you think about the Samsung Gear S? Were you looking forward to a stand alone smartwatch? Seoul, Korea – [August 28, 2014] – Samsung Electronics Co., Ltd. today unveiled the Samsung Gear S, the next generation smart wearable device that expands the smartphone experience to the wrist. The newSamsung Gear S delivers an up-to-date smart wearable experience with 3G connectivity and wearable optimized features to meet the evolving needs of consumers. Designed with an elegant, curved Super AMOLED display and flexible band, the Samsung Gear S fits comfortably on user’s wrist. Through 3G connectivity, the Samsung Gear S offers a new, powerfulwearable experience and gives consumers the freedom to live their life on the go. The Samsung Gear S features a 2-inch curved Super AMOLED display, providing a richer view with abeautiful and easy-to-use user interface. It allows users to read messages and notifications at a single glance with features such as conversation view and condensed font. The Samsung Gear S’s chic, curved design fits comfortably around the contours of the wrist, while its customizable screen options and changeable straps empower users to express their own taste and style. The Samsung Gear S extends its communication capabilities to include 3G as well as Bluetooth and WiFi connectivity, allowing users to stay informed with seamless notifications from social networks, calendars and applications even when away from their phone. It lets users to instantly reply to incoming messages using the onscreen keyboard, or utilize enhanced S voice functionality to ensure tasks can be completed immediately. Finally, with the Samsung Gear S, people can seamlessly make and receive calls directly from their wrist, or get calls forwarded from their smartphones. Also announced today with the Samsung Gear S is the new Samsung Gear Circle. When paired with a smartphone, users can easily receive calls, listen to music, and make voice commands in style through a Bluetooth connection. It features a magnetic lock which clasps around the user’s neck when not in use, as well as a vibrate function to signal incoming calls and notifications.